On Saturday, December 29, the City Hall presented part of the new fleet acquired by the Phoenix Consortium, made up of 73 units. Check out our blog for more information. Operación del Transporte Colectivo en el Réveillon 2019: acceda para más informaciones. Confirms details of the year-end and holiday season operation on the Phoenix Consortium website. Access the site with the news. The Fênix Consortium informs that due to the strike of the truck drivers in the Country and the scarcity of fuel for buses and essential services, that the collective transportation of Florianópolis will operate with SATURDAY schedule on Monday, 05/28/2018 for the conventional one. The EXECUTIVE service will not be operated, with hours suspended on Monday. Due to the truck drivers' strike in the country and the shortage of fuel for the buses, the Fênix Consortium informs that the collective transport operation of Florianópolis on Friday (25) will continue with the schedule of Saturday for the conventional system and schedule of working days for Amarelinhos (executive transport). School lines (181, 280, 291, 296 and 941) will continue with normal attendance. On Saturday (26), the operation will take place with Sunday timesheet. From 0h on Saturday (26) the lines of Madrugadão will be suspended. The complete schedule, time lines and itineraries are available in the timesheet section of the website and in the Floripanoponto application. The Phoenix Consortium also maintains the telephone (48) 3025-6868 and the e-mail sac@consorciofenix.com.br available for registration and clarification of doubts. We wish all mothers a happy Mother's Day! A Sunday full of happiness, health and with your family are the votes of the Canasvieiras team. The company team inspected on February 19 eleven (11) new vehicles that should integrate the company's fleet, renewing conventional vehicles. Follow in our social network news about the process. 2017/2018 summer timetable starts this weekend! It is time to advance one hour the appointments, watches and cell phones. Be aware: on Sunday the cars already operate at the new time. Attention external service provider: as of 10/16/2017 new rules are applicable for this type of negotiation and supply. If you have any questions, please contact your supply team, or log in with your login and password in the system usage manual, available on the quotation portal. More safety in your travel: embedded system of video surveillance, check this link for news. The CCO (operational control center) of public transport was inaugurated this Monday. Learn more by accessing the information here. Customer service of conventional public transport: as determined by the SMMU will be applied changes in several lines for July 24, next Monday. Sign in and check out: site do consórcio fênix. On June 30 the company started operating five new vehicles! It is more safety and comfort for you in your commutes. The Municipal Secretariat of Transportation and Urban Mobility - SMMU informs that, in order to facilitate the embarkation of the passengers of the lines "212 - TISAN - TICEN Direct"; "331 - TISAN - TICEN via Mauro Ramos" and "332 - TISAN - TICEN via Beira Mar", there will be a box exchange in Platform B of the Center Integration Integration Center - TICEN. These lines will exchange the box with lines 221 - TICAN - TICEN via Mauro Ramos, 231 - TICAN - TICEN via Beira Mar and 156 - Administrative Center via Mauro Ramos from 06/26/2017. The company officialized the fleet renewal for 2017! In all, the company is renewing five heavy vehicles, expected to be delivered by July, and three 15-meter vehicles, scheduled for delivery in September / October. It is more quality and comfort for you in your journeys. June 5th is the world's environmental day. Since 2008, we have adopted an environmental approach focused on reducing waste, efficiency and reducing resource consumption. We recycled up to May 2017 67,825,000 liters of water, and we sent 174,325 kg of waste, 62,981 liters of lubricants and 10,653 tires for recycling and disposal. We do our part, and you? It is the small daily attitudes that preserve our planet and its resources! Caution for temporary changes to the operation due to the IRON MAN event. Access this link from the Phoenix Consortium for information. We wish all women a happy international women's day! They are the votes of our team, and a great Wednesday to all! Next Sunday (02/19/2017) the Brazilian summer time is closed 2016/2017. The clocks should be delayed by one hour. Sicronize your cell phones and watches. Buses operate at the new timetable starting Sunday, zero hour. Check the rules for lost and found: access the description by clicking here. Check out the six new 15-meter vehicles. Click here for information. Adjustments in public transport from September 01, Monday. Check the Consórcio Fênixx news site. Since September 01, the terminal TICEN also has the internet Gratuíuta service. Learn more on the website of the Consórcio Fênix, customers service provider. The Consórcio Fênix today launched the new free internet service to the SIM system customers. Available initially in TICEN, should cover all public transport integration terminals. Check out the information in the link: http://www.consorciofenix.com.br/fenixconecta. Check out the adjustments in force since 1 August 2016 on the link. For more information, visit the Consórcio Fênix. Mother belly or hand life. Mother always or chosen ... The types change, but love does not. Happy Mothers Day! This Friday morning (March 18), at the closing meeting of the 16th external quality audit, the auditor had recommended the company to renew the quality cycle for the period 2016 to ISO 9001: 2008. Thus, the company successfully passes its 16th pro external audit quality. 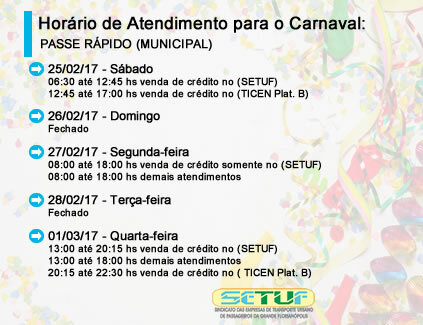 The Consórcio Fênix informs that the following adjustments to the conventional transport will be held, which will come into operation on February 15, 2016, as determined by the Municipal Urban Mobility (SMMU). Follow the link for more information: informações site Consórcio Fênix. Inform all suppliers and market the online quotation system was activated at 13:00 today (01/04/2016). In this way, suppliers begin to inform the eigenvalues and supply conditions, our sales team. An email was sent instructions to all our registered supply base, and our team is at disposal for any questions. The Canasvieiras Transport wishes everyone a great 2016! The team Canasvieiras Transport wishes all its customers and partners a Merry Christmas with lots of health, happiness and success. New Year's Eve operation in 2016, check out the link: Consórcio Fênix. visit the link to see the information. Care providers. On 01/04/2016 enters the air quotes online portal of the company. We ask all the attention related to recadastro processes and generation of hits. Suppliers who are not in the data up to date, will be blocked responding company's quotes. To be driven by supply staff, observe the information carefully. The supplier will receive login and password, and must carry out the updating of records of their companies. Quotes are now filled by vendors in electronic trading process. With this, the company seeks to increase the convenience of access and communication between supply processes and suppliers, as well as improve their compliance practices. The Passe Rápido, responsible for the marketing of electronic card credits the municipal system, issued notice to the opening hours of the service. Stay tuned, these are the operating hours for the sale of services TICEN. The operation of the bus will be announced by the Consórcio so confirmed by PMF. The Order of the Phoenix painted the whole fleet of blue to make sure u will not forget BLUE November. Until 1333, which is a Volvo ZF maxo to karambalho makes preventive review, you know? Prevent queridu. In this Tuesday, 03/11/2015, various network services suffer adjustments and synchronization. Visit the Consórcio Fênix and get all the information. Be sure to sign the newsletter from Consórcio to be notified in advance of changes of services. Questions or suggestions? Be sure to write here and send it to the team. We wish you all a happy Children's Day! Be sure to watch our commemorative video for the date. Go through this link or by our fanpage. This Monday, as determined by SMMU, the timesheet will be Sundays and holidays because of the holiday of October 12. More information, visit: : Consórcio Fênix. On October 05, several SIM network services will have adjustments and synchronization. Check in Phoenix Consortium website information by clicking here. The App.Fênix, Consórcio Fênix application that offers various information such as schedules, routes and even maps, now supports multi language and several improvements. The same is free and can be download the app stores of the Android platform, Windows Phone and App.Store. Be sure to stay on top of the shipping news in any time and place, using your smartphone. The company Canasvieiras reports that the Consórcio Fênix went on to run the selection of candidates for the vacancies driver and collector of the municipal system. If you are interested in applying for these posts in any system operator, send your data and resume to the Consórcio, the link: acess here. In this Tuesday, several services have adjustments as determined by SMMU. The Consórcio link, check out the details for services: click here for information. Lines 135/136/137/138/185/212/841 executive and 7220 were adequate. More information, visit: Contact the Consórcio. In this Monday, Brazil's independence holiday, the timesheet will be Sunday, as determined by SMMU. Information: please visit here. Due to variations in travel times required to fulfill the boards of public transport schedules in order to ensure greater compliance of service to the customer service, the SMMU reports that changes in timesheets the lines of conventional public transport service will be applied to from the day 20.07.2015. Information at this link. Consórcio Fênix informs that, as determined by SMMU (Municipal Urban Mobility) from July 20, 2015, there will be changes in the lines of conventional and executive services. More information at link. Campaign all by better public transport, from origin to destination - 004 CYCLE: Priority. In July and August, the campaign will be addressing the need to prioritize the collective. The first theme is the financial accessibility to public transport. As a social service, costing policies and subsidies aimed at reducing the impact of costs on passengers, apportioning them with society. Check out the video and track the materials throughout the month! Hall gives notice changes for the month of July. Be sure to check the news in the transport system on this link. Be sure to download the App.Fênix, application service for mobile devices offered by the Consortium Phoenix. Get access to all the data lines: timetables, routes and maps. Visit the link below to learn more! The sixth campaign video all for a better public transport, from origin to destination has been launched! The theme of the campaign in June are the preferred places of the collective! Whenever possible, let the waves of free collective prteferenciais if other are available. In the absence of people in need of the same, the use is free. Places are preferred and not exclusive, after all, all have the common sense and concern for others. Preferably to those in need. Share this good practice! One of the contractual targets set by the Consortium Phoenix to Florianópolis City Hall has just been fulfilled. The concessionaire would have until April 30 to standardize 66.67% of the fleet available for operation with the colors and logos created by the city of Florianopolis. Since the start of operations, 374 units were standardized, already totaling 69.39%.